BEAUTIFUL LAKEFRONT CONWAY HOME. THIS 3 BEDROOM 2 BATH HOME HAS LOADS OF LIGHT AND GREAT VIEWS OF LAKE INWOOD. 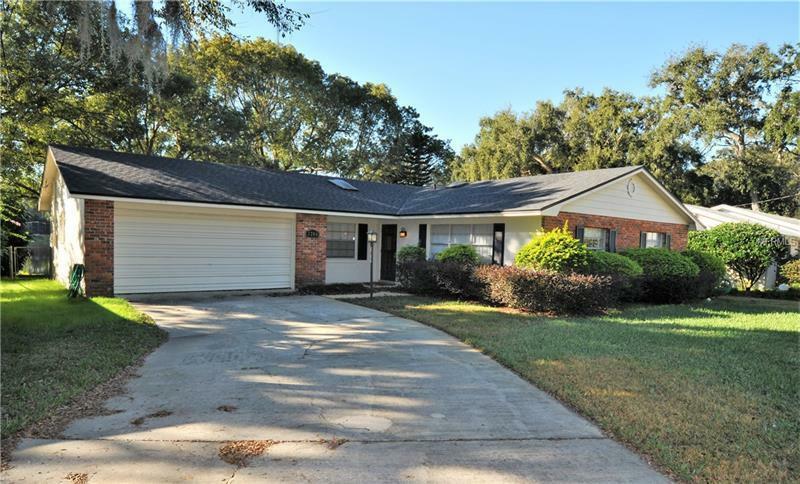 AS YOU ENTER THE HOME THROUGH THE FOYER - TO YOUR RIGHT IS A LARGE LIVING ROOM WITH LARGE WINDOWS AND TO YOUR LEFT YOU ENTER INTO THE FAMILY ROOM WITH SLIDING DOORS THAT LEAD TO THE LARGE SCREENED PORCH AND YOUR LAKEFRONT BACKYARD. OFF THE FAMILY ROOM IS THE KITCHEN WHICH IS SPACIOUS AND OPEN. LIGHT KITCHEN CABINETS AND STAINLESS APPLIANCES APPOINT THIS KITCHEN WITH LAKE VIEWS. OFF THE KITCHEN IS A LARGE LAUNDRY ROOM WITH TONS OF PANTRY SPACE AS WELL. ALSO FROM THE KITCHEN IS A SEPARATE DINING ROOM. THE MASTER BEDROOM WITH LAKE VIEWS FEATURES AN EN-SUITE BATHROOM WITH LARGE STAND UP SHOWER. THE OTHER TWO BEDROOMS ARE GENEROUS SIZED AND THE GUEST BATH HAS A TUB/SHOWER COMBINATION AND A SKYLIGHT WITH NATURAL LIGHT. LAKEFRONT LIVING - ENJOY YOUR SCREENED PORCH AND BACKYARD ON BEAUTIFUL QUIET LAKE INWOOD. THIS HOME IS A MUST SEE. NEW ROOF JULY 2018, NEW LAMINATE FLOORING IN BEDROOMS. Copyright © 2019 Mid Florida MLS. All rights reserved. The data relating to real estate for sale on this web site comes in part from the Internet Data Exchange Program of Mid Florida MLS. Information provided is for consumer's personal, non-commercial use and may not be used for any purpose other than to identify prospective properties consumers may be interested in purchasing. List Right Realty participates in the MFRMLS Internet Data Exchange (IDX) program, allowing display of other MFRMLS broker's listings on this site. However may not include all listings currently available. Information is deemed reliable but not guaranteed. Information last updated at 2019-04-22 17:28:45.